INTERNATIONAL: #Stags’ skipper Krystian Pearce completed his first 90 minutes in the yellow shirt of Barbados last night, as the commanding defending made his full debut in their 2-2 draw against Guyana in the CONCACAF Nations League. INTERNATIONAL: Well done to defender @RyanSweeney97_ who tonight completed 90 minutes in Republic of Ireland under-21s’ 1-1 draw with Kosovo under-21s! The Stags' defender received his call-up for Barbados' fixture against Guyana, and if selected to play, will make his first senior international appearance. 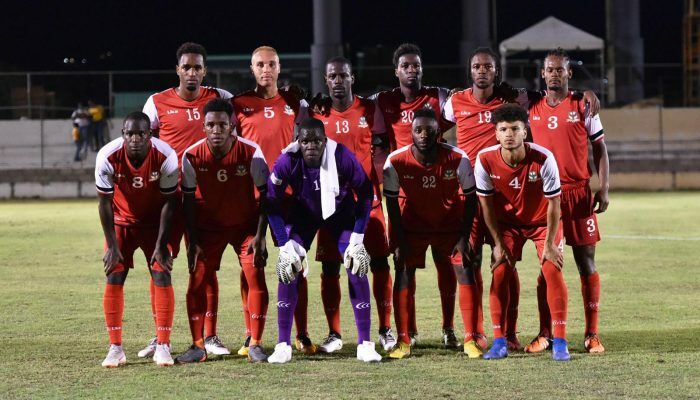 The two sides will face up in their CONCACAF Nations League qualifier at 7pm local time (12am BST) at the National Track and Field Centre at Leonora. The CONCACAF Nations League will begin in September of next year, and the teams involved will play four qualifiers between this month and March 2019. After each team has played its four qualifiers, they will be assorted into three leagues (A, B and C), with relegation and promotion among them. The top ten ranked teams from qualifying will also gain access to the CONCACAF Gold Cup. The 12 teams in League A will be broken up into three groups of four teams, with the winner of each sub-group facing each other in March 2020 to determine the overall champion. Similarly, the 16 teams in League B will be split up into four groups, with the winner of each group gaining promotion to League A, and the sides that finish bottom being relegated to League C.
The on-loan Stoke City defender has been called up for Republic of Ireland under-21s' fixtures against Kosovo (Friday 07 September) and Germany (Tuesday 11 September). The 21-year-old has appeared for the under-21s on one previous occasion, and the under-19s on five occasions. Both of this weekend's fixtures are EURO under-21 qualifiers, with the competition taking place in Italy in 2019. Republic of Ireland currently sit second in their qualifying group, three points behind Germany with one less game played. The most notable opponent that Sweeney could come up against is Borussia Dortmund midfielder Mahmoud Dahoud, who represents Germany's under-21s. Sterling-James has been called up for Saint Kitts and Nevis' fixture against Puerto Rico on Sunday 09 September. Along with Pearce, the Stags' forward's fixture is a CONCACAF Nations League qualifier, meaning there is more at stake than your typical international friendly. The 24-year-old has appeared for Saint Kitts and Nevis on two previous occasions, one of which was an international friendly against Armenia. Former Manchester United and now-Arsenal midfielder Henrikh Mkhitaryan played in the game, scoring twice. We wish the best of luck to all of our players on international duty this weekend! Mansfield Town’s Sky Bet League Two match at Crewe Alexandra on Saturday 08 September has been postponed due to three international call-ups from the Stags’ squad. Captain Krystian Pearce will represent Barbados for their CONCACAF Nations League qualifier against Guyana on 06 September. In the same competition, versatile attacking midfielder Omari Sterling-James has been selected by St Kitts to play in their match against Puerto Rico on 09 September. Republic of Ireland U21s have called up defender Ryan Sweeney, on loan from Stoke, for their UEFA U21s qualifiers versus Kosovo on 07 September and Germany on 11 September.